Dr. Rosa will present In the Shadow of Empire: St. Clair Drake and the Struggle Over African Studies in the Cold War from 4 to 5 p.m. Tuesday at Downing Student Union, room 2123. 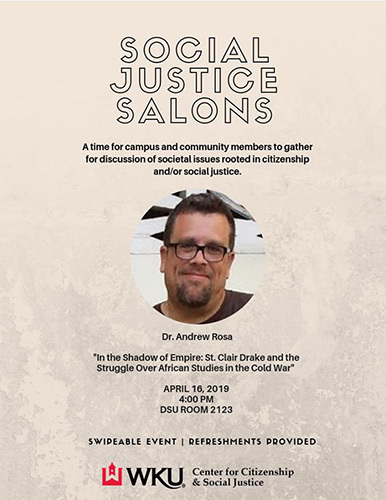 During the “Social Justice Salons” series, WKU faculty, staff, students and community members gather and discuss complex contemporary issues surrounding citizenship and social justice. The typical format of “Social Justice Salons” includes a short presentation on a topic, followed by facilitated discussion. Tuesday’s presentation is open to anyone interested. Refreshments will be provided.